Over the past few months, it seems that after nearly every market appointment, I was gifted an iPad case. That would be great IF I actually owned an iPad. But, since I just forked over a pretty penny for new office laptops, I have no desire at this particular time to invest in an iPad. That being written, I enlisted the aid of my tech-loving sister Michelle to test all the swag I received, and share with me which case was a keeper. After several weeks of grueling testing, it was clear Case-Mate's Venture Case ($89.99) was the winner. Trusting my sister's sense of style and her desire to always marry fashion with function, my team reached out out to the lovely people at Case-Mate to make sure you too, actually THREE of you, will enjoy the pleasure of using this iPad case. In addition to gifting three cases, Case-Mate has gone a step further and will allow winners to select the color of their choice (provided they are in stock.) There really is a case for every occasion and personality. Gentlemen, no need to enter my giveaways just for your wives or girlfriends. Win something for yourself! A special thank you to Case-Mate and Kaplow PR for putting this giveaway together. 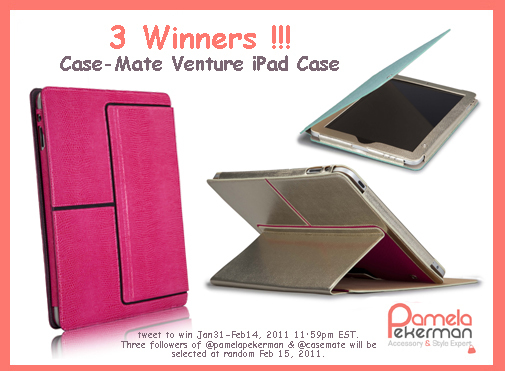 2) Retweet (RT) "Dress up my #iPad with @CaseMate Venture Case #GIVEAWAY w @PamelaPekerman http://ow.ly/3NrpC #accessories #PamPekermanCaseMate"
After a weekend of intense food poisoning coupling with back aches and a flu, there was nothing more soothing than finally slipping out of bed late in the afternoon and placing my feet in the best slippers ever! Ballet Slippers form Dearfoams have a cozy faux fur lining that doesn't make your feet sweat, like so many furry slippers. At $24, they make a great hosting gift or if you have a friend who just gave birth, she'll love them. Unlike most slippers I have worn in the past, these have a nice structured base and side support. Oh, and they are machine washable, which is always a nice plus for us busy gals. Now me and my Dearfoams slippers are going to sit by the fireplace and watch E! 's Screen Actors Guild Awards coverage, as my husband finishes baking his first apple pie. Being under the weather has some perks ;). You know how I feel about my jewelry, so you can only imagine how thrilled I was on Tuesday to have the team from Lia Sophia send over a bag full of baubles which I could wear on Good Day New York. To accent my black and grey faux fur vest (purchased at T.J.Maxx for $49) and black Herve Leger skirt, I ended up selecting Lia Sophia’s Cluster Ring ($125), Wrapped 2 Ring ($150) and Sequence Bracelet ($350). Maria Menounos loving her Lia Sophia bracelet at Sundance Film Festival 2011. Images: Lia Sophia. Lia Sophia was the hottest jewelry brand at the Sundance Film Festival, with celebs like Kerry Washington,Kay Panabaker, Lake Bell, and Access Hollywood's Maria Menounos (featured above with the Royale gold bracelet) stopping by the Samsung Galaxy Tap Lift suite to pick up dazzling goodies. What a week! Wednesday, after much hustle – we’re talking a three day turn around – my team and I were able to pull together a fun fashion segment for FOX’s Good Day New York. A BIG “thank you” to all my lovely pr guys and gals who send over information and samples over the weekend, especially Kelsey, Naomi, and Kate. You rock! If you follow me on Twitter, you know that the segment was supposed to air live on Wednesday at 9:45am, but was pre-taped due to yet another snowpocalypse that dominated air time. If there was any dought that the 1970s is going to be the decade du jour this coming spring, Hollywood’s golden gals set us strait – Farrah Fawcett hair and all – at last night’s Golden Globes. Jennifer Lopez looked stunning in her Zuhair Murad gown, followed by a short, angelic number from Marchesa for the after party circuit. Other notable Boogie Nights-inspired looks: Sandra Bullock in a blush, one-shoulder Jenny Packham gown with sparkling embroidery, Julianne Moore's one-shoulder misstep (sorry just didn’t feel the excess fabric) in Lanvin, and Angie's emerald green (another one of the evening's trends) backless gown with pointy shoulder pads. Not planning on going to an awards show any time soon? Have your own 70s style statement with a chicly wrapped silk scarf around your head. Salvatore Ferragamo had a slew of interesting and soothing prints sashay down their spring 2011 runway. Reasonably priced (by luxury brand standards) at $160, the scarves are great way to buy into this iconic fashion house. My sister owns several of their scarves and is quite happy. My current count: zero. But, that might change this season. The scarves will be available at select Salvatore Ferragamo boutiques nationwide in March, but you can get on the waitlist by calling 1.800.628.8916. The first time I heard the name John Derian, I had just stepped into the Lulu Guinness boutique on Bleecker Street in NYC. Brie, the US public relations representative for Lulu Guinness at the time, was explaining the inspiration for the fall 2006 collection her client created with John Derian. Since then, I’ve been an admirer of Derian’s decoupage plates, lamps and other home décor accessories. In addition to his shop in New York and Massachusetts, there is a lovely assortment of his work on the seventh floor at Bergdrof Goodman. 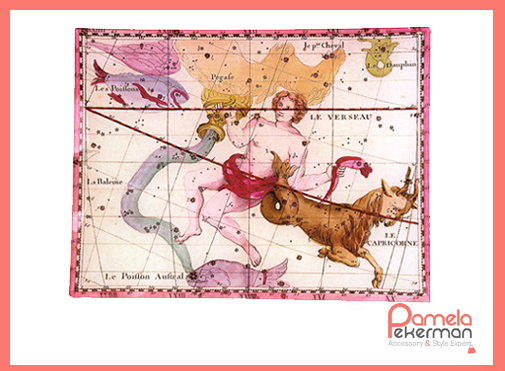 Currently, my wallet is itching to cough up $110 for this rectangular, decoupage plate which has a colorful representation of my zodiac sign, Capricorn. I want to hang it in my new office over a shinny white cabinet from IKEA. What do you think? Would you pay or pass on this piece? It's my favorite day of the week - TFIG and Footwear Friday. I'm having a serious love affair with my shoe closet, filling it up with designer duds from Yves Saint Laurent , Alexandre Birman, Jimmy Choo , Tory Burch and more. So, I couldn't very well, step into the New Year without discussing (and if the designer still has my 5.5 size, buying) a pair of Ruthie Davis pumps. If you still don't know this name, a woman I've been raving about for nearly five years, check your fashion pulse! Ruthie Davis Angelina Peep-toe Pump, Winter 2010. Ruthie Davis' sky-high, killer-drama heels have graced the pages of every major magazine and have walked down the Red Carpet with the help of Hollywood heavy hitters like Beyonce, Fergie, Chelsea Handler, and Selena Gomez. Take a gander at the mixed-metal heel on the Angelina peep-toe pump? It's good cause for a shoegasim. OK, catch your breath ladies. The Angelina, which retails for $895 at http://www.thehipchick.com/, was first introduced in fall 2010 and has already been worn by Rumer Willis (shown below), Myley Cyrus, Beyonce and Demi Lovato. The spring version of the Angelina ships in early February and is part of Davis' neutrals story with monochromatic studding on metallic uppers. For die-hard Ruthie Davis shoe fans, bright pops of color still found their way into the new season. I’m packing my bags for Sundance – it’s time to rub elbows with the cool Hollywood kids like Natalie Portman and Shia Labeouf. OK, so I’m not actually going to the Sundance Film Festival this year. But, were I to go, the Field Tote in Phony Pony from Oughton Limited ($350) would be my traveling companion. 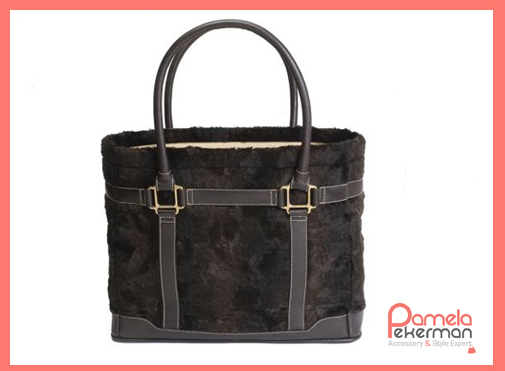 It’s the perfect carry-on handbag that can easily transition into your day bag, once you reach your cold destination. (No fur handbags in Mexico ladies). The Italian faux hair tote is camera-ready for the slops scene, with an open top and easy-access inner pockets for your iphone. After all, you’ll want to snap all your favorite actors and of course the Kardashian girls – they will be there; they are everywhere!! Oughton Limited's Field Tote in Phony Pony. ﻿ Oughton Limited is inspired by the equestrian life and you actually get a sense of regal pride and simplicity from looking at these bags. There’s nothing razzle-dazzle about them, but then again a well-bred horse doesn’t need anything except a polished mane to look powerful and poised for the race. The woman who carries an Oughton Limited handbag doesn’t need to scream style via excess hardware or bold color choices. She’s a lady who speaks softly with her accessory choices, yet everyone hears her statement. And, when I’m at the airport, there is nothing I love more than seeing a woman just like this walking through the airport in ballet flats, wearing black trousers or leggings, a long-sleeve white men’s shirt and a refined carry-on tote. Oh, just the vision makes me long to sit at JFK and wait for her to walk by. Have you seen this woman too? How do you like to accessorize your travels? When I snapped this picture last October at the CC Skye Spring 2011 preview in New York, I was drawn in by the ethnic, metallic-mesh print. When I came closer, and snapped even more images, I realized the “mesh” was actually metallic gold laser cut leather. You really have to see The Town & Country Viceroy bag in person to appreciate the craftsmanship. The tote will be available beginning February 28th at Bloomingdales.com and select Saks Fifth Avenue stores for $750. What do you think of this bag? Are you a CC Skye fan? Several weeks ago, I raved about an Echo straw hat that I just had to have for my trip to Los Cabos. Take a look at this picture; is it not utter perfection on my cabeza? Sadly, (visual: me with a frown and puppy dog eyes) my hat did not arrive in time from the showroom, so I’ll have to wait to showcase it on my next sunny adventure. Don’t fret my darling accessory lovers. Perhaps sensing my pain, my pr friends at Tracy Paul & Company (which represent Echo Design) were kind enough to send over the new SOHO K Cuff from Greek-based accessory powerhouse Folli Follie (another one of their clients). Folli Follie is opening a store in Manhattan’s Soho area this coming February and the SOHO K Collection will be exclusive to the store. If you are interested in this unique piece, available in black and clear for $105 each, contact the Madison Avenue store to get on the waitlist (212) 421-3155. I own both colors, but prefer to wear the black one mid-way between my wrist and elbow Cleopatra style. It looked great paired with a flowy printed DVF dress and suntan. How will you wear yours? I'm back from Los Cabo and excited to kick off another year of accessory hunting, business planning, giveaway offering, event hosting and much more. Speaking of giveaway, conngrats to @megans_madness for winning the M.Clifford Designs Clutch and PONO bangle. 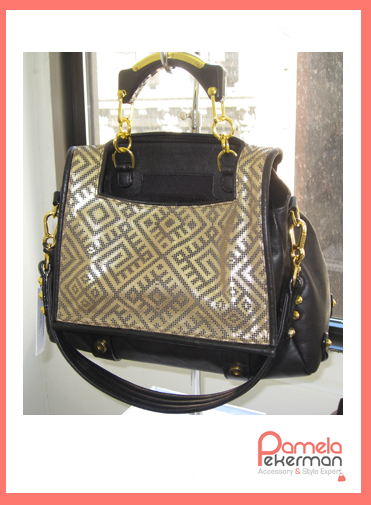 If you haven't won anything yet, here's another chance to get a great handbag from contemporary designer Bryna Nicole. I recently spotlighted her Hermann School Bag, which hits stores in just a few few weeks! 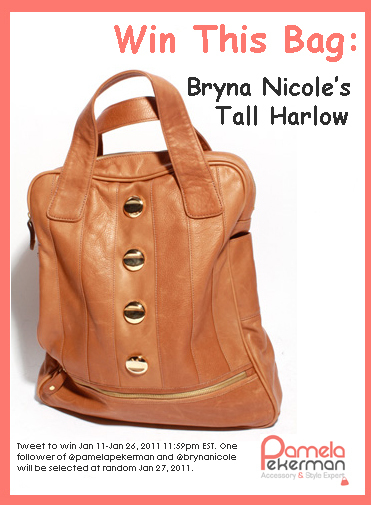 Until then, I'd love for one of you accessory-loving ladies to enjoy Bryna's classic Tall Harlow tote. Not interested in toting this in your arm? There's a should starp, easy wear. Warning shorties: this is a long bag so if you are 5 feet and under and win this bag you will need to rock your killer heels - as if you needed an excuse to go sky high! 2) Retweet (RT) "It's a New Year, I need a New Bag from @BrynaNicole #GIVEAWAY thanx @PamelaPekerman http://ow.ly/3C3gw #handbags #bags #PamPekermanBNicole"
Happy New Year and greetings from Los Cabos, Mexico. I´m recharging my battery and thoroughly excited for the year ahead - this bouncing rabbit is going places, as are all of you, I´m sure! 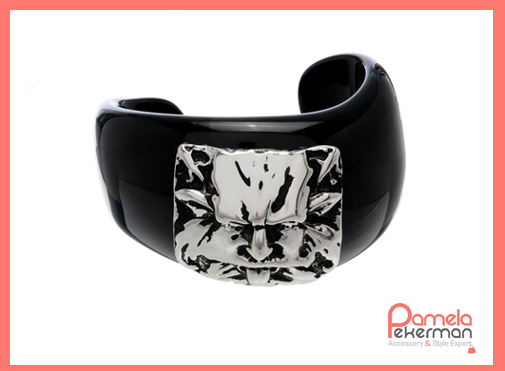 What better way to kick off the year and than to highlight an accessory that is supposed to help you stay healthy. I´m sure you have heard all the chatter on cable news networks about cellphones causing cancer due to high levels of radiation. One time, I even saw an x-ray of a human brain where the cancer was by the ear and almost in the shape of the phone! In November, my pr friends at Kaplow invited me to preview the latest goodies from Case-Mate and it was there that I learned about the Bounce case. The Bounce is supposed to redirect your cell phone’s electromagnetic energy away from your head. Currently only available for the iPhone 4, the case is built with Pong technology. It’s the only technology certified by the Federal Communications Commission proven to decrease overall cell phone radiation by 60%. I can´t do an independent study and vouch for it´s effectiveness, as I can with other accessories I spotlight, but the Bounce is worth a shot even if it deflects 10% of the radiation away from your body. Take a moment to read the handy manual that comes with your current blackberry or iPhone - the manufacturer actually warns you, in very small font, of the dangers associated with your phone. Be smart, be healthy and use protection -- for the cells people, what did you think I was talking about? If you have purchased Case-Mate´s Bounce, please post a review.